A group of South Korean scientists have developed a new type of peptide to treat autoinflammatory diseases such as rheumatoid arthritis, the science ministry said Wednesday. 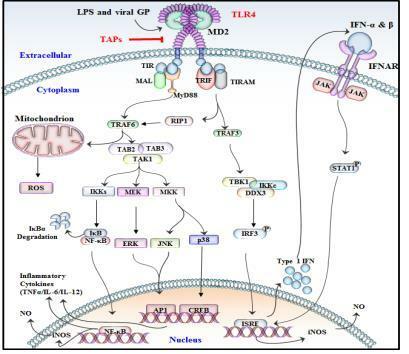 Autoinflammatory diseases are defined as the loss of self-tolerance in which an inflammatory response occurs in reaction to inappropriate triggering of Toll-Like Receptor-4. The team led by Choi Sang-don successfully designed small peptide inhibitors of TLR4 and developed novel TLR4-antagonistic peptides that combine with immune cells in the body without any side effects, the Ministry of Science, ICT and Future Planning said. "Here we report novel TAP, identified through phage display, endowed with LPS-induced proinflammation inhibition and confirmed in mice," the researchers said in a paper. The researchers said the finding could lead to a broad range of practical clinical applications in the treatment of more than 100 kinds of autoinflammatory diseases ranging from rheumatoid arthritis to diabetes. "This study resulted in fewer side effects compared to previous studies and is bio-friendly. Also, the novel peptide treatment directly targets TLR4 and blocks it," Choi said. "An experiment in mice showed that the new peptide treated rheumatoid arthritis and kidney tissues."